The Atlanta Recorder Society’s mission is to promote recorder playing in the metro Atlanta area through information about upcoming events, opportunities for group playing, connecting recorder players in the area, concerts, workshops, and other opportunities. We meet monthly, usually on the 3rd Sunday of the month (but check our calendar for possible date changes) for a 2 hour playing session. Playing sessions are held at Morningside Presbyterian Church, Room 201, located at 1411 North Morningside Dr, Atlanta, GA 30306, from 3:00 p.m. until 5:00 p.m. Non-members are welcome to join us. We will have copies of music to play from, but please bring your own instrument/s and a music stand. 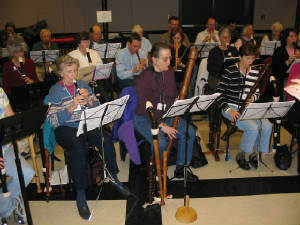 In celebration of March being “Play the Recorder Month” instead of a playing session we host our annual Consort Day. Consort Day is an opportunity for individuals and small groups of musicians to gather together to play and hear each other’s accomplishments. We encourage you to contact us if you would like more information or are interested in joining the ARS.